The iPad Pro pushes the boundaries of tablets in interesting ways as a general-purpose laptop replacement, but how does it change the photography game? 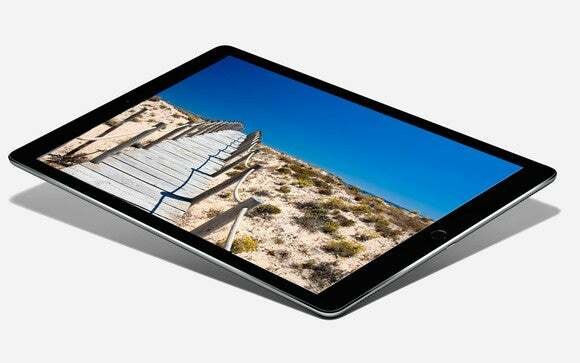 Photographers have been drawn to the iPad since the first model, hoping it can provide a mobile workflow when they’re away from their computers. The iPad Pro pushes the boundaries of tablets in interesting ways as a general-purpose laptop replacement, but how does it change the photography game? Editing photos, especially with the addition of Apple Pencil support in some apps, is a definite improvement, though limitations in iOS keep the iPad Pro from achieving its full potential as a photographer’s mobile companion. It’s impossible to ignore the beckoning light of that brilliant 12.9-inch Retina screen, and the promise of nearly desktop-class processing power. Plenty of apps let you edit photos, such as standouts like Google’s Snapseed, Adobe’s Lightroom mobile, VSCO, and of course Apple’s own Photos app. Before and after using the Apple Pencil to lighten the right side of the face. The ability to multitask in apps that support it can also be helpful. 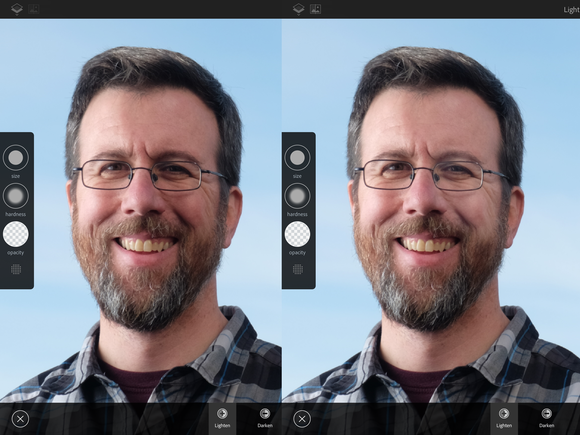 Lightroom mobile and Adobe Fix can run side-by-side, and they can both access the same libraries via Creative Cloud Sync, enabling you to send an image from Lightroom mobile to Fix to perform some spot healing, a feature missing in Lightroom mobile. 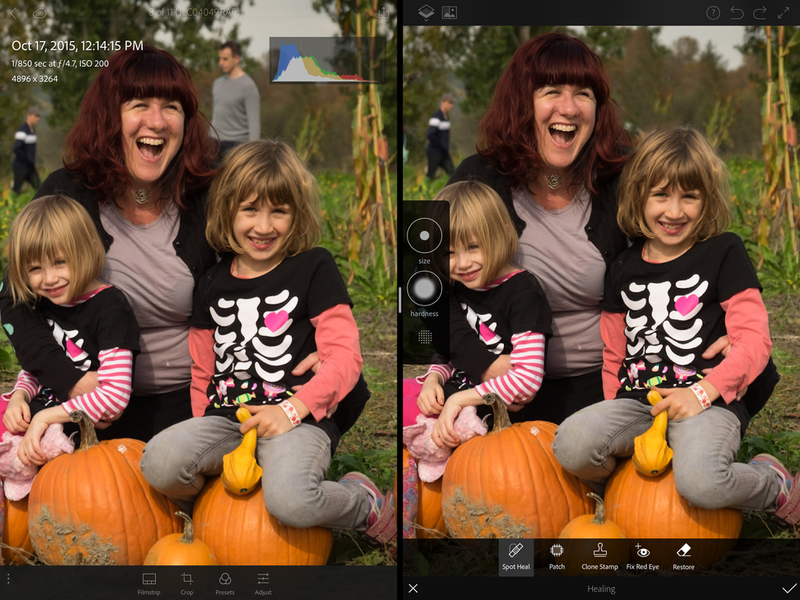 Removing a bystander from a photo in Lightroom mobile (left) using Adobe Fix (right) in Split View. The closest to a seamless experience is shooting raw and using iCloud Photo Library. You don’t edit the raw image itself on the iPad, but changes you make are applied to a JPEG version the Photos app creates and saves with the original. That edited version shows up as the image on your Mac and other devices—it’s not a separate copy, which is created when you edit in other apps. However, that JPEG becomes the edited version; if you were to continue editing it in Photos on the Mac, for example, you’d be working with the JPEG version, not the RAW version. I’d hoped that the iPad would be a great field photo-triage tool: import photos directly, sort and rate the images, and assign keywords—basically, handle a lot of the less-exciting tasks of managing one’s photo library during the downtimes before you get back to a home or office Mac. But for a variety of reasons, the iPad isn’t part of most workflows at that stage. A poll I ran on my iPad for Photographers site revealed that people aren’t bothering to assign keywords or ratings to images on the iPad; the prominent apps that enabled this, Photosmith and PhotosInfoPro, are no longer being updated. When you import images, they’re saved in the Photos app, where you can only mark shots as favorites and move them into albums. If you primarily use Lightroom on the desktop as your editor of choice, it’s more common to flip the model around: Import photos into Lightroom CC on the Mac, sync them using Creative Cloud, and then work on rating and editing the images using the Lightroom mobile app on the iPad at your leisure. The edits apply non-destructively, and Lightroom bypasses the RAW issue by converting RAW images to Adobe’s DNG (Digital Negative) format during sync. As with many things about the iPad Pro, the superior hardware is waiting for the software to catch up. Gradually, third party developers are adding Pencil support for image retouching, which is a welcome jump forward. And all image editors benefit from the speed gains enabled by the iPad Pro’s faster processors. But the lack of RAW support in iOS hinders pro and enthusiast photographers from developing workflows that avoid duplicating work or depending on a Mac to get started. Granted, iOS has always been designed for the broadest possible audience, and even in a device labeled “Pro” that same foundation applies. Now that the iPad Pro is released, I’m holding out hope that Apple will take action to help it fulfill its potential.